While our historic wilderness camp offers the comforts of home and is ideally situated in some of the best Elk Habitat in Montana, it provides Outdoorsmen with a memorable MT Hunt and the authentic feeling of how life was experienced over a century ago for mountain men and women in the old west. This area includes resident herds and is a major Elk Migration route from Yellowstone National Park. Weekly bookings are limited to small, personal groups of no more than 5-6 elk hunters per week. To ensure personal attention to each hunter, we provide a guide for each hunting client. That’s your own personal Montana Hunting Guide furnished by trustworthy Backcountry Outfitters! Sage Peak Outfitters is one of the most trusted Elk Hunting Outfitters in Montana. 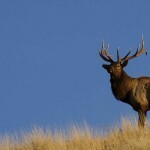 Our professional Elk Hunting Guides are knowledgeable, passionate, and experienced when it comes to Hunting in Montana. Since we book only small groups, our guarantee is that each booked hunter will receive the personal attention that he or she deserves. We have the knowledge and expertise to answer any questions about Big Game Hunting Animals, and we will assist you with information about Montana Elk Hunting Regulations, help you obtain a Montana Hunting License and teach you about the most useful Elk Hunting Strategies. In addition to providing personal attention from Elk Hunting Guides, our Elk Hunting Trips include three hearty meals per day, comfortable accommodations, and a Gear List for Elk Hunting. Whether you’re interested in Bow Hunting Elk, Wilderness Hunting, Private Land Elk Hunting, Montana Antelope Hunting, Hunting Montana Mule Deer, or Montana Whitetail Hunting, our dependable Elk Hunting Guides can provide you with the trip of a lifetime!